One of the things that excites me most about coloring Pandoras Box’s work is the chance to take some of the sketches floating around and really flesh them out. PBX has a huge archive of work, and a lot of them are just sketches without the fine-tuning you’d expect from a finished piece. Since I do all of my work on top of the original, I can work with these as well as I can the finished ones, with similar results. That’s what this one is, and I’m very happy with it. Hopefully you guys will be happy with it, too. I can’t stress enough how great PBX has been about these colors, either. It’s really been a pleasure, and I look forward to doing many more colors like the ones you’ve seen so far in the future. Still working on my Pandoras Box kick, here’s a non-DBZ pic that’s always been one of my favorites. Just everything about this pic is great for me. Ash and Misty going at it on Jessie’s back is golden enough, but then all the little details like Jessie’s expression or James sleeping in the back do nothing but add to it. Throw in Delia with her camera as a nice touch, too. Hopefully you all can enjoy these colors as much as I’ve enjoyed the original over the years. It’s been a while since I posted an Eromugen page, but hopefully now you can all see why. 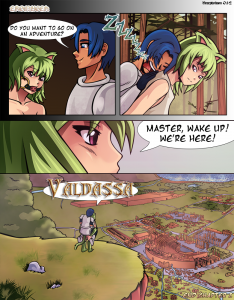 I’m really proud of this page, and not just because of the city shot of Valdassa (which took forever due to my asinine way of inking and coloring), but also because I really like the juxtaposition of the top two panels. But anyway, this wraps up Chapter Two (finally). I’ve got some commissions coming up, plus some old ones that need some tending to, so it may be a week or two before I get around to the Chapter Three cover page. However, once we get into there we should be able to see these characters move forward a little bit. Until then, I hope you’ll continue reading and enjoying the comic! The WWOEC Woman of the Month for February 2014 is Brenda Glover, from the Nick Jr. show “Little Bill”. I vaguely remember my kid sister watching this show back around the same time as Blues Clues and Dora the Explorer, but I had pretty much forgotten about it until it came up here. I’d certainly forgotten about the mom, and I doubt I would’ve ever drawn this picture if it weren’t for the WWOTM system. I wasn’t sure what I wanted to do at first, but I decided to borrow a few concepts from Pandoras Box here. Things like putting them in an inflatable pool, or having the sister standing by with a camera, are all inspired by some of PBX’s work. Obviously my skill level isn’t there, but I think the final result is pretty satisfactory.